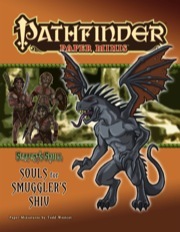 This set includes 84 key NPCs and monsters from "Souls for Smuggler's Shiv", part one of the Serpent's Skull Adventure Path. In this pack you will find deadly denizens of the jungle, the restless shipwrecked dead, and a tribe of cannibals! The short: My wife wanted to get into Pathfinder. So I started a home game of Serpent's Skull and printed these off. We played Friday night for a few hours. As I was reading NPC entries and what they look like I stopped, looked up at the board, and said "Wow, just grab the minis, they look exactly like that!" Todd does such a fantastic art job with all of these minis. I have never felt such a relief with a new player (my wife for that matter!) than to not try to coerce their imagination into seeing a character and being able to just say "Look at this one, it looks exactly like that!" Also something to note, I use pawns as well. I didn't want to feel like I wasted money (economy and what not) so I had sought a way to combine the two and be able to pack the minis in my pawns box. What I did was Cut them out, fold the bases in between the two sides (without gluing on the bottom circle), and plug them into the Pawn bases. Works great and saves room (as well as giving you WAY MORE MINIS). The pawns aren't so big in comparison as everyone says, and it helps if your players are the ones using pawns to help differentiate from the monsters on the board. This stuff is the bomb, yo! I want all of them now. And I hope he does the next Adventure Path! Best paper mini artist EVER!!!! I was looking at how to get minis for my next AP found these wonderful mini's which sort of made the choice for me. I love them the detail is amazing. I really liked the canible the best and the undead pirates. Great value. I know I am going to be enjoying these a lot when my next game starts. A new Paper Mini Artist. And his work is as good as the rest. This Awesome set includes some great minis that are going to show up in a bunch of other modules for me. The undead and "animal" mosters have character. The "character models", including the tribesmen and vegepygmies fit in well with other PF Minis sets. What else can I say? $5 = 84 paper minis. Now available (and welcome Todd)! Cool! Glad to see another paper mini artist on board! NO!!! stop feeding my obsession! 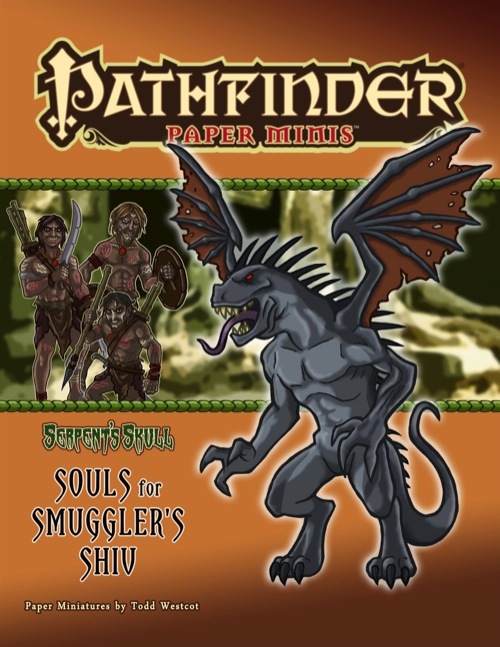 How soon until we see the other Serpent's Skull Paper minis? Serpent's Skull #2 has over 100 minis in it, so I would not expect anything until early September. I am at part 4, so more interested myself in 4-6. But I am sure others would like to know too, so thanks. SO I should not expect part 4-6 in the time frame I could use them in or the current AP? Thank you! It's quite a thrill to see my work in the Paizo store. I hope folks enjoy these minis as much as I enjoyed working on them. Hold it right there! I demand Paper Minis for KM #3-6! Please. I don't know how fast your group plays, but how fast they are released depends greatly on the artist and the number of minis in each set, so I'm not going to make any promises. Maybe we'll have paper minis for Jade Regent by the time we start to run it, eh? Those are by a different artist, and she's trying to clear her schedule to start attacking them. Cool news! My fingers are kept crossed. I know, I know, but Serpent Skull is one of those unlucky "in between" APs for our groups. But it is really nice to see, that there are now many artists having taken to the Paper Minis. To all of you: keep up the excellent work! These really are great. I've been a fan of paper minis from the beginning, the ability to show people awesome representations of the villains really does add a lot to the game. Great work. And the fact that I just started this Adventure path (we're going to have the second session in a week) makes this set so handy. Thanks guys. These look great Todd. Keep up the good work. Hopefully, I'll get some of these printed out (along with the Xin Shalast minis) in the next few weeks. But they already look awesome. Damn my booze-rich gaming nights! I was about to miss this product! Welcome to the new artist, can't wait to see more. Happy beyond words to have the paper minis line grow and cover more and more (so to speak) ground. Yea more paper miniatures for my horde. I have a question. Will we be seeing more for the Legacy of Flame AP and will we see Curse of the Crimson Throne any time soon? I hope so, and the first Crimson Throne set I hope to have before the end of the year (my artist for that has a couple of projects to finish before then)! *Runs around like a goblin on fire* I am such a fan of paper minis. Once upon a time, long, long ago I had oodles of time to paint metal minis - now I barely have enough time to print out a character sheet. HOORAY for paper minis!!! and both my sons aren't bothered whether we use paper, plastic or paper minis. Perfect timing! I'm going to start the Serpent's Skull AP this weekend, and these are going to be plenty handy. Just wanted to pipe in that I adore the artwork used for this Paper Mini :) ~ Fingers crossed that the rest of the AP come soon. Thank you! Rest assured I'm working diligently on the next set and they'll be out as soon as they're finished. do we have any idea of the release of the next one. I am starting this AP end of this month and just want to pace myself so I can start the next around the time the next minis come out. i have a question regarding durability are these just regular paper or are the thicker more like beginner box thickness. just curious, they look really good. i still haven't heard what the quality of paper mini's are, i understand weather and what not but if i could get an answer soon that would be great, i'm running serpent's skull again soon and am very curious. They are paper although you could print them out on thicker stock depending on what your printer can handle. Also, there is a way to convert them to the BB pawns. I posted a link in this thread that has a great tutorial for how to make them. EDIT: I should emphasize what Liz said, they're pdfs only so it's really up to you. I've been using the paper minis for the last 2 parts of the AP and never had a problem with the durability. I use them on regular printer paper. Only one time did someone close a book too fast and sent a couple of them flying off the battlemat (being paper they are a bit light after all). A friend of mine uses plain paper for his as well, but he likes to glue the medium sized ones to pennies to give them a bit more weight and prevent such "fly aways". Shrug. They're PDF-only, so they're on whatever paper stock you print them on! thanks to everyone for the help. very informative, i'll purchase one of the sets when i have a few bucks to throw around. i hope seattle has made it through the terrible weather. having lived in seattle and now the midwest i'm no stranger to the delays and headaches of inclement weather. have a great weekend. Having just finished running a Serpents Skull campaign, I wanted to thank you for the great paper minis. It was good having just the right minis for each encounter. They look great, and worked a treat.